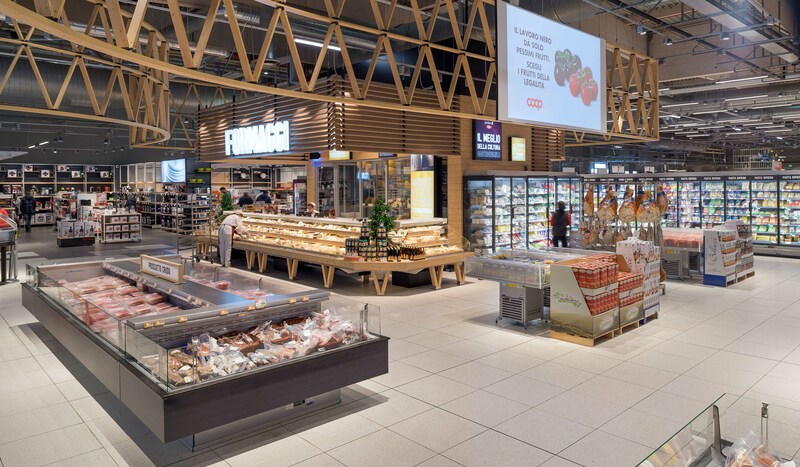 It is a revolution that is designed as a kind of going back to the roots, in which the supermarket takes on the role of an urban market. The central nucleus consists of Via dei Freschi, featuring the distinctive Rossini Evolution Costan cabinets, whose clever play of colours guides consumers through a familiar and stimulating environment. These self-service cabinets are stunning for their countless possibilities of customization: light wood, for example, characterizes the Butchery and Cheese area, while sophisticated dark wood accompanies the customer among the unique flavours of the products proposed in the Delicatessen. Unmistakable design, without sacrificing optimum food safety: to guarantee the best freshness and unbeatable quality of the products, Misa cold rooms have been chosen. In Extracoop stores, the word shopping takes on a different and personal meaning for every consumer: hence, every discovery must be communicated in the right way. While for some people, Extracoop is a place to lose themselves in the atmosphere of old local markets, for others it is an opportunity to take a trip to the future, amid the high-tech aisles of packaged fresh and frozen food, enclosed within the Costan GranVista Next positive vertical cabinets, available in Open and Closed versions, the GranBering frozen cabinets and the Aeria Next positive semi-verticals of the new GRANFIT range. A concentration of design and great transparency with sleek and modern lines, striking coordinated aesthetics and unrivalled visibility of the products, thanks to panoramic uprights and fantastic LED lighting.